Mobile app competition winner shares her experience. Anyone starting a business today has kindred spirits in other local entrepreneurs. 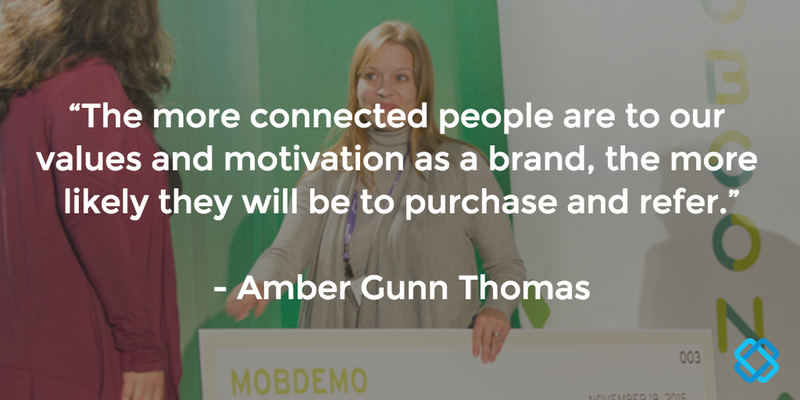 That learning and camaraderie defined what The Patchery founder Amber Gunn Thomas took away from presenting as a MobDemo, mobile app competition, finalist at the fourth annual MobCon. That — and plans for using her $10,000 in development credits from MentorMate and $500 in legal credits from Grey Plant Mooty. We connected with Amber to learn her development plans for 2016 and the best advice she took away from MobCon in November 2015. What problem are you hoping to solve for users of your app? We jokingly say that The Patchery is the love child of Pinterest and Etsy. Using Pinterest, you get to humor your inner do-it-yourself, but you are often really disappointed with the end results. On Etsy, you get to buy beautifully crafted merchandise, but you don’t get to participate in the making process. The Patchery brings you the best of both of these worlds. You get to mix and match fabrics to create a one-of-a-kind kid’s outfit, then we expertly craft it for you. Right now, our customers can do this on our website. Research shows that only about 50% of people, while on mobile, prefer a responsive website. The other half prefer an app, and we are underserving that audience. What was most exciting about presenting your idea at MobCon as a part of the MobDemo mobile app competition? Meeting the other participants. It’s always so energizing to be around other people hustling to make a dream reality. Do you plan to make any changes to your app after hearing from attendees at MobCon? Yes. Other attendees and especially presenters really got me thinking about the best way to use an app. I always thought it would be a replica of our website, but now I’m thinking about other ways that we could use the app to provide a richer experience. What advancements/development do you hope to accomplish in 2016? Our website continues to be our primary focus in 2016, but I hope to bring that second screen more into play. I’d love to find a way to leverage an app to drive more engagement with The Patchery. How will this development help you build your brand, increase awareness or break into a new market? The more connected people are to our values and motivation as a brand, the more likely they will be to purchase and refer. What was the best advice you heard at MobCon? How did you collaborate with other speakers/attendees during your time at the conference? I loved meeting the other MobDemo contestants. They really understand the day to day hustle of starting a business, and it was nice to hear their insights, experiences and challenges. To learn more about MobCon and the insights gathered from attendees, download our annual research. Want more from us? Check out our archive of free resources here!